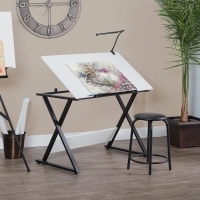 With its white top and contrasting charcoal frame, the Studio Designs Axiom Drawing Table gives a stylish, graphic look to your space. The design is simple and modern. The large 42"W × 24"D tabletop offers plenty of space for your projects. 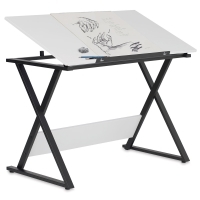 Tilt the work surface up to 40° for a comfortable drawing angle. A 24"W pencil ledge keeps markers, pens, and more right at your fingertips. 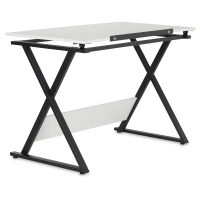 The Axiom Drawing Table has a durable powder-coated steel frame and comes with four floor levels for stability. The rear panel adds rigidity. 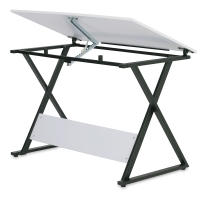 Upgrade the drafting table by adding a Studio Designs Premier Metal Art Tray or a clamp lamp (sold separately). 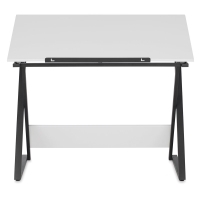 The table measures 30"H × 42"W × 24"D overall. For more measurement details, please see the Item Specs tab.